What really drew me to work on this piece was the idea. The concept to create a design which can be interpreted by each individuals personal taste in music. It’s neither genre confined or a declarative fatuous verse. For me, I look at this and feel the blues. I don’t just see it or read it, but feel those dampening tones weighing heavier and the dizzying effect of sorrow. Hot-sticky summer bars, almost absent of oxygen, and filled with loneliness. It’s quite fascinating how folks can turn their suffering into such a gratifying melody. It seems like both mediums share some similar qualities. This design was completed over the course of 2 sessions totaling about 7 1/2 hours. 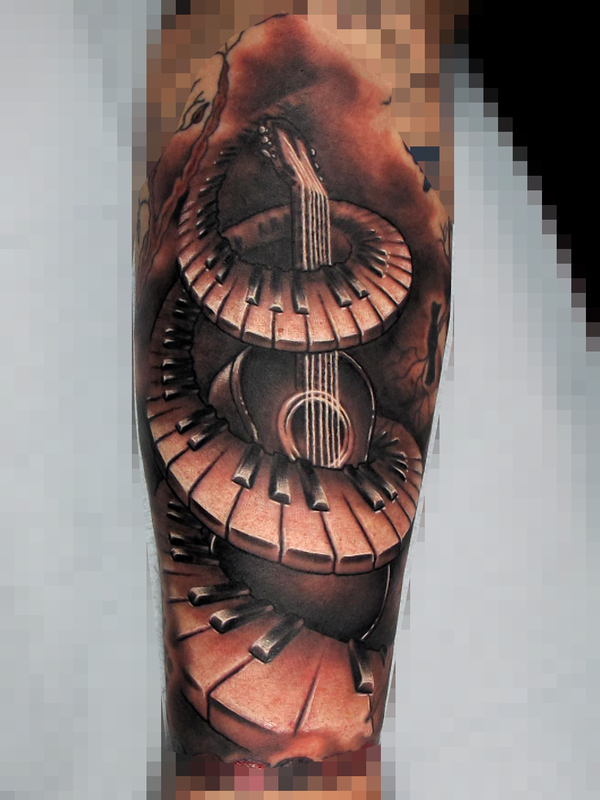 This entry was posted on May 2, 2012 at 1:19 am and is filed under Tattoo with tags Acoustic Guitar, Piano Keys. You can follow any responses to this entry through the RSS 2.0 feed. You can leave a response, or trackback from your own site. Dude you are awesome! My friend is the piano keys tat, but wow your other work is spectacular, I know where I am going for my next tat. Being a musician myself I can say I want this on my body. My un-tattooed parts are jealous. It does speak the blues to me too..love it!